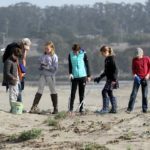 On June 8 the U.S. Environmental Protection Agency (EPA) announced that the 2015-16 fifth grade class at Mount Madonna School (MMS) in Watsonville will receive the President’s Environmental Youth Award (PEYA) for their work to fight environmental threats faced by the Western Snowy Plover. The awards are presented each year to exceptional students and teachers who demonstrate creativity, innovation, and leadership to address difficult environmental challenges. Students will be honored by an EPA representative in a ceremony at Mount Madonna School at 1:00pm on June 13. The class has also been invited to Washington, D.C. in late August for a national ceremony recognizing the 2016 PEYA awardees. 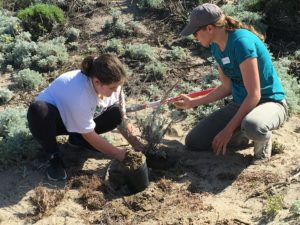 Over the 2015-16 school year the students created an educational movie on the environmental hazards faced by snowy plovers; wrote letters to elected representatives; cleaned up local beaches, replanted habitat at Moss Landing State Beach, and prepared nesting habitat at the Elkhorn Slough National Estuarine Research Reserve. Students collaborated with California State Parks to create informational signs to protect wintering flocks at Seabright State Beach; and worked with the Last Plastic Straw organization to encourage a movement to have restaurants voluntarily refrain from serving plastic straws. Straws are a leading type of beach pollution and once degraded into microplastic, can be ingested by plovers and other marine animals. They also convinced school officials to switch to refillable whiteboard pens to reduce plastic waste. The students created an educational video that was used to help educate the public, and presented at the Monterey Bay Aquarium’s 2016 World Ocean Day celebration and Plastic Pollution Summit. “I am continually inspired by the passion of my students as they find their voice to create positive change within the world,” shared Jessica Cambell, fifth grade teacher and project mentor. “These kids are so dedicated to this cause and empowered as citizens. During this project, for weekend after weekend, recess after recess and hours and hours after school, they worked in so many ways to do all they could to protect this and other animals from various environmental threats. This is the second time Mount Madonna School fifth grade students have received this national recognition. In 2015, students learned they were awarded the PEYA for their 2013-14 work to protect endangered sea turtles. This winter Mount Madonna School’s high school participated in Yes! Magazine’s National Student Writing Competition. There were six winners chosen from 2,000 submissions, and two of the winners are part of our community. Mara Peruzzi was one of three Powerful Voice Winners. Imogen Cockrum was the winner of the high school category (out of 727 students). Students then responded to the prompt: Describe how you would feel if a place that defines you was threatened to be destroyed or taken away. What would you do? Would you fight to save it? As the competition rules dictated, I could choose three essays from each class to submit to the competition. There were many excellent essays, so it was very difficult to narrow down the selection. The essays I chose stood out to me as exceptional; they illuminated each student’s passion with a strong voice and powerful grasp of language. Brigg, Carl, Izzy, and Tara’s essays were chosen as Literary Gems, wherein a selection from their essays is published with the winning essays. Aki’o, Tara, and Noah were all told that they had been finalists. I am constantly wowed by the stories, poems, and essays I read in the classroom, but it is such an amazing honor for our students’ work to be recognized on such a grand scale. (Mount Madonna School, CA, 2/8/2017) — The Seed of Flame, an environmental STEM project undertaken by a team of seventh grade students at Mount Madonna School (MMS), is one of 16 finalists nationwide to receive a $10,000 prize through the 2016-17 air and climate Lexis Eco Challenge. Now in its tenth year, the national Lexus Eco Challenge is intended to encourage middle and high school students in developing and implementing environmental programs that positively impact their communities. Participating student teams can enter either or both of the initial challenges addressing environmental issues related to land and water and/or air and climate. Contest sponsors Lexus and Scholastic chose 16 finalists nationwide for each challenge. Each team receives $10,000 in grants and scholarships, and is invited to participate in a final challenge, with a chance to win one of two $30,000 grand prizes. In addition, eight first-place prizes of $15,000 will be granted, with a total of $500,000 presented. The students have launched a social media challenge on Instagram, @seed_of_flame. The public is invited to post pictures of themselves or others hugging a tree, with the hashtag “#hugatree”. Select photographs will be compiled into a public art exhibit. The challenge will be used to raise money for the organization, Trees for the Future, through the student’s online fundraising campaign at https://donate.trees.org/seedOFflame. The goal is to raise $640 which is enough to help a family in Africa grow and maintain a forest garden, providing food security and enhancing environmental resources for generations. In addition to #hugatree, students are creating a film collection of people around the world planting trees, and are reaching out to communities across the globe to participate. They have also created a YouTube video, “Seed of Flame Claymation,” and are in the process of creating a video game. Last fall, this 10-student MMS team participated in the initial air and climate challenge. 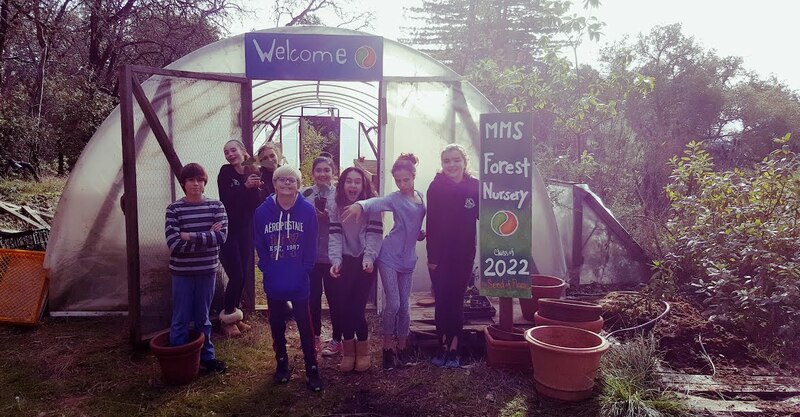 Inspired by the Loma Fire, a nearby wildfire that occurred in fall 2016, they developed an action plan that can benefit their local community by transforming a school greenhouse into a forest nursery to restore forests after wildfire, disease, and other human impacts. “We need to understand that wildfires are a necessary part of our forest ecosystem, but climate change is making it more difficult for forests to regenerate on their own,” commented MMS science teacher Katrina Leni-Konig. “Wildfires in California are larger, burn hotter, last longer, and are more frequent than usual. The forests need our help!" Students began a small seed bank in their science classroom, with seeds gathered from the forest property surrounding the MMS campus. Once established, the forest nursery and seed bank will serve as an ongoing educational resource for the school and broader community. 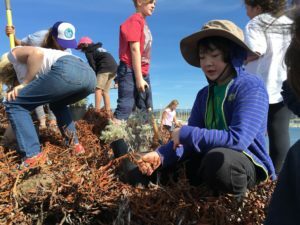 At present, the students estimated that the forest seed bank contains thousands of seeds including acorn, redwood, manzanita, madrone, and coyote bush. “I love that we will be able to help the community restore what forest was lost in the fire,” said seventh grader Alyssa Manzur. Students are planning to plant the seeds in their forest nursery before spring time. Once established, the plants will be transplanted to areas needing restoration at Mount Madonna, as well as coordinating with Cal Fire in regards to a restoration project at the Loma Fire site. Students are planning to provide plants for habitat restoration, as well as installing equipment to measure erosion. Plans are also underway to offer a week-long summer camp for middle school students to learn about forest ecology, stewardship, and human impacts to be held at MMS. To learn more about their project, visit sites.google.com/mountmadonna.org/theseedofflame/.